What happens if you shift the library to be the center of the community platform for innovation? The exponential age is characterized by a shift from an S-curve world to a world where there are sequences of rapid punctuated evolutions. This can be thought of as a curve of continuous change. 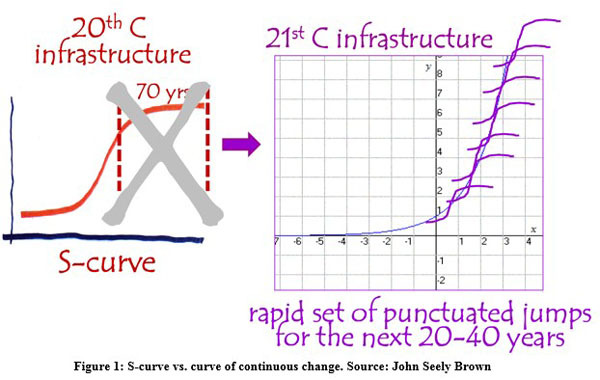 Brown explained that, in an S-curve world, a broad change in institutional trajectory is followed by 60 to 80 years of relative stability, providing sufficient time to reinvent social practices in the wake of change. With the curve of continuous change, waves of rapid change lasting about 18 months each follow one right after the other, presenting tremendous institutional challenges. These include capital and operating expenditure challenges, staffing challenges and design challenges. “Yesterday’s cutting edge is today’s dust bin,” Brown wryly observed. Brown highlighted another hallmark of the exponential age—a shift from stocks of knowledge to a world of knowledge flows. Where knowledge was once stable for many years, now the half-life of a skill is estimated to be about five years. Learning is centered on the creation of tacit (as opposed to explicit) knowledge and genres are fluid. Reading context is as important as reading content. Imagination and curiosity are assets. For some individuals, the greater challenge may be unlearning old ideas and skills rather than acquiring new ones. This situation presents challenges to formal schooling and the community’s ability to build in a timely fashion the institutional architectures that support formal learning. Innovation provides a competitive advantage in a knowledge-based economy. Libraries have the potential to be platforms for innovation and entrepreneurial activity in the community. However, like the community itself, libraries must foster a culture of innovation and look to ways to foster new thinking and experimentation at the edges of institutions and connect them to the centers. Collaboration works best in person. Innovation requires vision with execution. Cultures of innovation are shaped by members who bring the diverse perspectives and experiences of the tribes that they come from: designers, geeks, artists, tinkerers, engineers. Members of these ecosystems are highly curious individuals. Moreover, the ecosystems of which they are a part do not require them to seek permission to pursue their curiosity or experiments. Isaacson observed that individuals who operate at the intersection of two diverse realms such as art and science are positioned to imagine possibilities that others frequently cannot imagine. Institutional innovation often occurs at the edges of institutions where there is less need to seek permission and it is easier to form new collaborations among diverse groups. People at the center of institutions are rewarded for moving along prescribed leadership pathways and maintaining the core functions of the institution. The unique characteristics of working and playing at the edge create more fertile ground for nurturing ecologies of innovation. Libraries are natural partners for innovation. “Forming communities and collaboration is the core of what libraries do,” said Isaacson. More and more, libraries are marking a return to the institution’s origins. “Public libraries didn’t start out as only repositories for books. They were places for dialogue and conversation. They were ‘knowledge tanks,’” said Mary Lee Kennedy, Chief Library Officer at New York Public Library. The innovation challenge in institutions such as the library is how to move breakthroughs that occur at the edges into the whole organization. For communities, the challenge is not only connecting the edges and the core more effectively but connecting the edges of multiple organizations to one another. Libraries can provide solutions to these challenges. What if you shift the library to be the center of the platform? “Then it’s at the center of the entire ecosystem,” said John Seely Brown of the Deloitte Center for the Edge and USC, and it is well-positioned to connect its edges with the innovators working and playing at other edges in the community. A network of partners with the library at the hub forms an ecosystem for innovation ready to enhance access, inclusion, learning and civic life in the community. Don’t ask permission. Get something going rapidly and show what you can get done, then ask for forgiveness. Show what you can do by spiral development. Don’t go for perfect. Keep metrics for you and others. The right metrics for measuring success can bring tremendous credibility. Leverage open source and being open. Engage a wide collection of participants, fostering diversity and collaboration. Exploit cloud computing and social media—technologies that connect. Philipp Schmidt, Co-Founder of Peer 2 Peer University (P2PU) and Director of Learning Innovation at the MIT Media Lab, discussed how these insights have played out in P2PU’s partnership with the Chicago Public Library (CPL). Schmidt said that moving quickly and not seeking permission—no lawyers involved, not even a memorandum of understanding (MOU)—has allowed for more time and attention to make sure the partnership would work and avoid getting hung up on the details. “What’s clear is that we are in the second iteration of the project and we are skating quickly and learning faster that we would have if there was structure,” said Schmidt. The support of CPL leadership, especially at the branches, has been an important factor enabling people to experiment. The experiment gained legitimacy with the backing of CPL leaders and participants were not afraid to make mistakes. Finally, ownership of the project at CPL was vital. “The library directors knew what they wanted from the beginning of the project,” said Schmidt.